Tucked away near the White Tank Mountains, PebbleCreek is a great option for active adults looking for resort-style amenities in a gated setting. There are a lot of good reasons to choose a gated active adult community for retirement. There’s a peace of mind that comes with knowing a security gate is located at the entrance of the community to ensure anyone who isn’t supposed to be inside can’t get in. For those who appreciate privacy, a gated community provides that by creating a barrier between you and the outside. And there’s something to be said for knowing that the amenities and activities in this community you decided to be a part of are indeed just for you and your neighbors. In the Phoenix area, there are plenty of active adult communities to consider, but only some of them offer a gated lifestyle. We’ve scoured the list and picked up the ones we think are worth a closer look. The gate that runs around Sun Lakes is a pretty large one. Considering this 40+ community includes 6,683 homes across five country club-style neighborhoods, each with their own golf course and amenity center, that’s a lot of ground to cover. What’s nice about having a gate here is that you’ve got a ton of amenities inside the community but right outside you’ve got very easy access to the south side of Chandler. The community is within minutes of the Interstate 10 and the 202 loop, which makes it easy to connect to Gilbert, Mesa, and Downtown Phoenix as well. 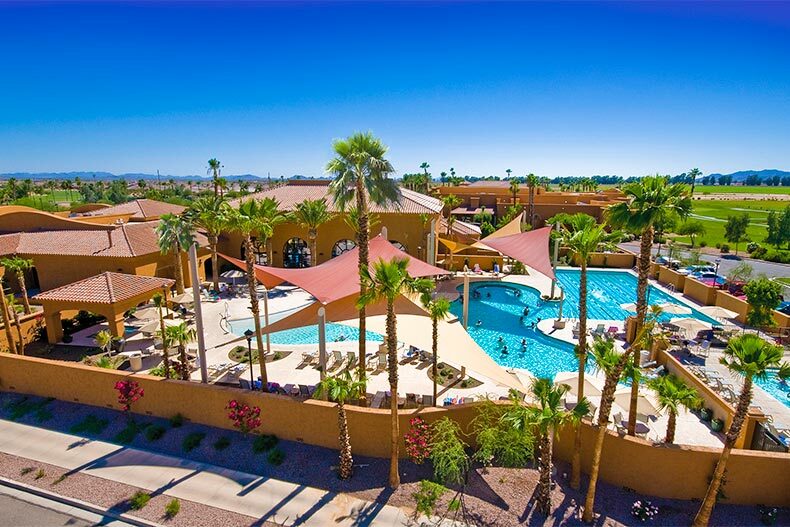 Located in Goodyear in the space between the White Tank Mountains, Estrella Mountain Park, and Downtown Phoenix, PebbleCreek is a 45+ gated community full of exciting amenities and a fun lifestyle. Residents gather each day at the 47,000 square-foot Eagle's Nest Country Club amenity complex, the Creative Arts Center at Eagle's Nest, the Tuscany Country Club amenity center, the Oasis Pool Complex, or at the numerous tennis, pickleball and bocce courts. There are also two golf courses and a thriving collection of clubs and groups for everyone in the neighborhood. The location near the intersection of I-10 and the 303 transit corridor makes commuting to Downtown Phoenix easy. Robson Ranch is another self-contained gated community with a lot to offer. With around 4,600 homes, this 40+ community needed to make sure they included enough amenities to ensure residents would want to stay put and they certainly delivered. Behind the gates, everyone who lives here has full access to indoor and outdoor pools, a state-of-the-art fitness center, hobby rooms, walking trails, tennis courts, softball field, fishing lake and more. What’s nice is that you get the security of living in a gated community but can still appreciate the surrounding mountain views and low desert air. Plus, since the community is located near I-10, it’s easy to get to Downtown Phoenix or Tucson. Trilogy at Vistancia offers a gated lifestyle within the Vistancia master-planned community, making it ideal for those who want privacy and enjoy being tucked away in an enclave surrounded by amenities and lifestyle options. This 55+ community includes 3,300 homes, a 35,000 square-foot clubhouse, and a slew of amenities just for active adult residents. Living in Vistancia also means access to Vistancia Village and the exclusive Blackstone Country Club. Situated just north of the 303 transit corridor, residents have easy access to the Phoenix area’s many attractions. Leisure World is a large, gated community that includes 2,664 homes and views of the stunning Superstition Mountains. The big appeal of this 45+ community is that it provides a secure hometown atmosphere while also giving residents easy access to Phoenix via Highway 60 and the 202 Freeway. Behind those gates it really is its own little town. There are twelve man-made lakes, two golf courses, a library with over 15,000 books, a post office, and the community’s very own newspaper. There are even registered nurses at the wellness center to provide medical care for residents. Trilogy at Encanterra in San Tan Valley offers 55+ residents their own little gated slice of life within the master-planned community of Encanterra Country Club. Dubbing itself "city-close but country-quiet,” it’s all about balancing the rural location with close proximity to Downtown Phoenix and suburbs like Mesa, Chandler, and Gilbert. Right outside the gates, residents will find stunning mountain views and many recreational opportunities that include hiking, biking, and nature watching. Inside, the 60,000 square-foot La Casa Club is the hub of activity. And there’s also an 18-hole championship course designed by Tom Lehman.